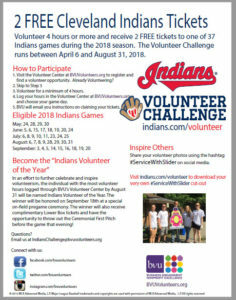 Information Coming Soon on the 2019 Indians Volunteer Challenge. Provide your email address here to be notified when we have more information. Many people across Northeast Ohio help their communities and experience the joy and fulfillment of volunteering. In the eight years the Indians and BVU have partnered on the challenge, over 42,000 volunteers have performed over 302,000 hours of service in Northeast Ohio; that amounts to the equivalent of $6.9 million worth of service to local nonprofits! Follow the steps below to participate. Click here to view detailed instructions to walk you through the process. Create an account in BVU’s Volunteer Center. If you have created an account in previous years, you will need to create a new one. BVU switched volunteer systems and old account information was not migrated to the new system. Search and connect with a volunteer opportunity. Volunteer for at least 4 hours between April 6 and August 31, 2018 (can be earned over multiple dates). Decide on which game you would like to attend. You must decide before proceeding to logging your volunteer activities in the next step. Log your volunteer activity. This is where you will select the Indians Game you would like to attend. Please note, only choose one game. If you log multiple volunteer activities, the first entered game day choice will be the tickets you receive. We will process your request. Please note this takes 2 weeks. You will receive an email from BVU with TicketMaster information to claim your tickets. Continue to log your volunteer activities. The individual with the most volunteer hours logged through BVU’s Volunteer Center from April 6 through August 31 will be named Indians Volunteer of the Year. The winner will be honored on September 18 at a special on-field pregame ceremony. The winner will also receive complimentary Lower Box tickets and have the opportunity to throw out the Ceremonial First Pitch before the game that evening! DOWNLOAD and post this flyer for all to see. Business Teams and Groups: Contact Ann Cancelliere at acancelliere@BVUvolunteers.org to learn how to receive tickets for your team.